Liz Hannah wrote the spec script for The Post, a thrilling drama about former Washington Post publisher Katharine Graham and her historic decision to publish the Pentagon Papers, a few months before the 2016 presidential election. A week before Donald Trump would be named the 45th President of the United States, producer Amy Pascal acquired Hannah’s screenplay, thinking, “Hillary Clinton is going to win, this will be perfect.” Despite the surprising turn of events though, the political landscape that’s followed since the election couldn’t have made 2017 more perfect timing for the Steven Spielberg-directed film. Meryl Streep portrays Graham, a woman continually silenced and dismissed by rooms full of men. After top-secret documents detailing the U.S. government’s involvement in Vietnam land on a reporter’s desk, the film follows Graham and Post executive editor Ben Bradlee (Tom Hanks) as they decide whether to risk the fate of the newspaper and publish the material. 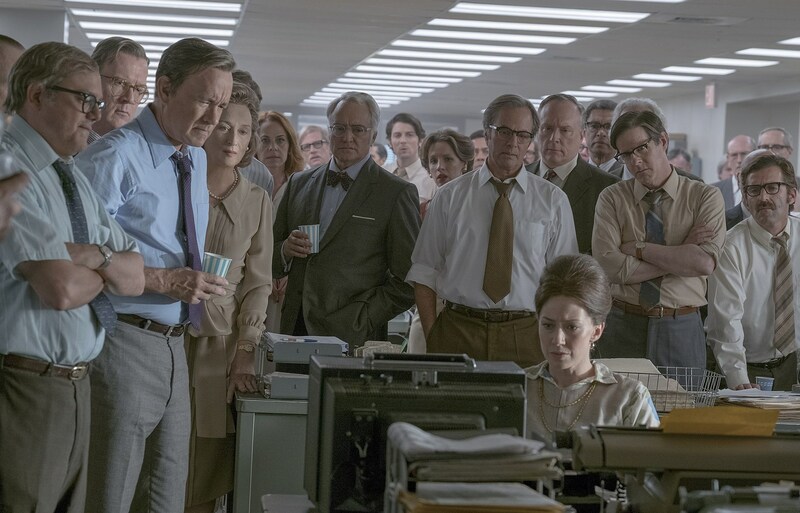 While The Post details the events of 1971, acting as a prequel of sorts to All the President’s Men – which, by the way, Graham was only referenced in during one lewd line of dialogue – watching it today feels like a reflection of our times. But don’t call it a liberal film. I spoke with Hannah and Singer about working with Spielberg and the film’s impressive ensemble cast. Singer told me how Streep gave the writers notes on set that made the script even stronger, and Hannah spoke about the importance of framing the story around Graham. Singer, who’s working on Damien Chazelle’s Neil Armstrong biopic First Man also shared new details about the Ryan Gosling-led project. Liz, you wrote the first draft and Josh, you came on right before production began, right? Liz Hannah: Yes, I wrote the initial spec in the Spring-Summer of last year, and Josh came on about 10 weeks before we started shooting. And this was your first screenplay? Hannah: My first-ever produced screenplay. First screenplay I ever sold. That’s wild. What did that feel like to have your first produced screenplay directed by Spielberg and starring two of the best actors in the industry? Hannah: It’s very surreal. It also sets a very high bar for what I do for the rest of my career. But I just feel very fortunate. I feel really lucky that everybody who signed on to the film came at it with such an immense amount of passion. It was really just a wonderful experience. Where did the story begin? Was it an interest in the Pentagon Papers or were you drawn to Katharine Graham’s story? Hannah: It all started with Katharine Graham. I read her memoir, Personal History, a number of years ago. I just fell in love with her voice. She has an incredibly unique way of looking at her life. She was very honest about her mistakes, about her insecurities, and it was so refreshing. So often you read about people testimonializing their lives, and her’s was much more of a reporting of her life, which is what she did. Her research assistant helped her basically interview everyone in her life over the course of a number of years, and she basically reported on it. Her book was wonderful and I wanted her story out there in the book. The book had won a Pulitzer Prize, but still, not everyone knew who she was. Josh, what did you bring to the script once you came on board? Josh Singer: Typically when I’ve worked on a script in the past, Spotlight or this movie I’m working on right now with Damien Chazelle, which is shooting down in Atlanta, you have two, three years to really hone and push a script. And here we had 10 weeks. So it was one of those wonderful, all-hands-on-deck. Can we – with the help of the Graham family, and [Graham’s research assistant], and with the help of Len Downie, who took over at The [Washington] Post from Ben Bradlee, and Andrew Rosenthal, Abe’s son, and all sorts of other helpers, and then Meryl and Tom – can we go from the best spec script I’ve ever read into a really good movie? Can we dig deeper, as it were. Which I think every script goes through in the lead-up to production, just often you have a lot more time. Frankly it was really great to roll up sleeves with Liz and everyone else to really push this forward. 10 weeks. That’s just crazy. What was the biggest challenge in getting the script ready for production in time? Singer: And frankly, we were re-writing a lot on set because we needed that time. One of the greatest assets we had was Meryl, who had this laser sense for what is good scene work, what is good character work. She did a fantastic job really pushing us scene-by-scene and would always say, “You know this scene isn’t working and here’s where it’s not working.” And of course it’s Meryl, so she’s much more lovely and graceful than that. And you feel like you’re being complimented even if she’s pushing at the holes. But it was one of these amazing things being pushed to work better than we were. Have you had that experience before, where actors have pushed back on set to help change the scene or the writing? Singer: I wouldn’t call it – when you say it like that it sounds negative. Working on Spotlight, although Tom McCarthy was doing as much pushing as anyone else, you always get notes from actors. The thing is, no one sees their character from their point of view like they do, good actors. So often the best ideas – I will say, working on First Man, we gave four or five drafts to Ryan Gosling. Some of our best notes that Damien and I got in the run-up to shooting were from Ryan. I think that’s one of the things, that if you have a great actor, [it] can be a real boot as you’re working on a script. And of course, the best notes of all come from the director, and when you’ve got someone like Steve, who’s just so good at what he does. 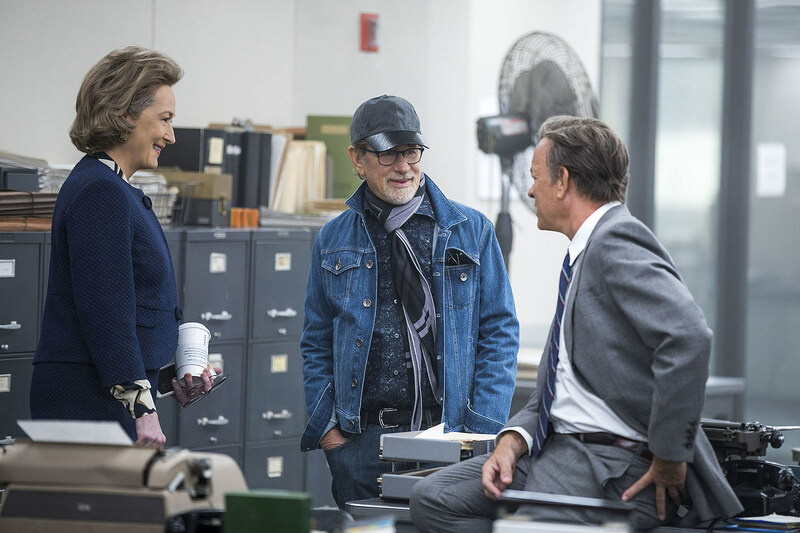 I think film is a true collaborative art form and as a writer you feel so lucky when you’re working with the great Liz Hannah and the great Steven Spielberg. You’re just really excited to come to work and try to get better. Liz, you wrote this before the 2016 presidential election. How did that inform how you wrote the script, which seeing the movie today, feels so relevant to the politics of 2017? Hannah: Well the part that always felt relevant to me was the story of a woman finding her voice. Kay Graham finally standing on her own two feet and making a choice, that was what really inspired me and was the central arc the script. I was writing that in the summer of 2016 before the elections, so that for me was the connective tissue to modern times. At that time the, using air quotes, “fake news” terminology didn’t necessarily exist. I think it was floating out there in the ether, but it definitely was not used as prevalently was it is today. And I sold the script to Amy Pascal I think about a week before the election. Do you hope that this movie will wake up audiences to the fact that little has changed since the events of the story? Hannah: Well first of all, I hope people have a good time and go see the movie. But I also hope people have conversations. I think we ask a lot of questions in this film about women in power, about the role of the free press. I think right now we’re living in a world where no one can be silent anymore, we all have to figure out how to use our voice. I think the story of Kay Graham is very representative of that, that she ultimately was put into a corner where she had to find her voice and she did, and she made the right decision. Singer: The genius of Liz Hannah, is that she framed this story in Katharine Graham’s personal narrative, which is an incredibly compelling story. So I think we both hope that a lot of people love the movie and enjoy the ride, and walk out for a real appreciation for who this woman was and how important it is for more women to be in charge of big corporations and perhaps governments. But also an appreciation for these values, and why these values are fundamental to our democracy. As much as this is a story about the media, it’s also such a human story that focuses on the relationship between Graham and Bradlee. What as your approach to writing those two and making their relationship such a major facet of the film? Hannah: Luckily those two were pretty big characters in real life. For Josh and I, it was like writing the origin story of this superhero team. Their relationship had never been depicted onscreen, and Kay Graham had never been depicted on screen. It was important for us to get it right. So not only was it fun to write them, because they’re both kinda ball-busters, there was something very similar about them. They both had an enormous amount of respect and admiration for each other. We keep calling it an unromantic love story. Not only was that amazing, but because we had access to the Graham family and Bradlee family, we were able to make it authentic and make sure that relationship rang true. Singer: Yeah, huge shoutout to the Graham family and Sally Quinn because this was a marriage, the two of them. And it’s this amazing story of a marriage that’s tested and winds up surviving and growing stronger, and winds up being an origin story for the team that was the backbone behind Watergate. It’s sad that Kay Graham isn’t depicted in All the President’s Men, because she played a huge role. You don’t run those stories without a strong publisher behind you. Getting that relationship right was of paramount importance, and Liz had done a great job, and we just got all this input from the families that made it even deeper. Spielberg is known for not doing rehearsals. Considering that, and how quickly the film got made, what was the process like working with him on set? Singer: There’s this great anecdote apparently, and this is hearsay so take it as that. But apparently, early on Tom asked Meryl if she wanted to run lines when they were on set just before the scene, and she was like, “Oh yes, please! [Steven] doesn’t rehearse!” [Laughs] But I think one of the wonderful things about not rehearsing is you get to see a scene coming together. That first scene of Tom and Meryl just sitting in the restaurant and talking, we wound up using really only the master, and we used the 12th take. And there was this amazing thing of, the first take was a little rugged, the second take it’s a little better, third it’s a little better, and by the 12th take you heard the overtones. It was this incredible scene, and it worked so well he decided, I don’t want to cut away, I want to stay in that master. And it’s a bold choice, you can see those actors doing their thing in this incredible way. So I think the not rehearsing allows for that magic in a way that, if something is over-rehearsed, you might not get that. Before I let you both go, I wanted to ask about your next projects. Liz, you’re writing Only Plane in the Sky, about Air Force One on the day of 9/11. Hannah: Yep. I just turned that in, so we’re out to directors right now. And then I just set up with Bradley Whitford and Amy Pascal for a limited Amazon [series] called The Mercury 13, based on another true story about the first woman who went through the space program. Oh wow, so both you and Josh are working on space projects. Singer: [Laughs] Yeah. And we’re currently shooting First Man down in Atlanta. We’re about two-thirds of the way through. That’s something Damien and I have been working on since middle of 2014 and it’s just a great story. Neil Armstrong was well-known as an icon, but he’s not well-known as a man. His story is, I think, really powerful and unbelievably heroic and devastating all at the same time in a way that I think most people don’t really know. He lost a daughter right before he joined the Gemini program. His two best friends in the Gemini 9, which was his group of astronauts, two best friends both died during the course of, one died during Gemini program 1, and Ed White died in Apollo 1. The tragedy and sacrifice he had to go through on the way to the Moon was pretty remarkable, so we’re excited to tell that story. There’s a lot more to that story than most people know, which is the fun of it. 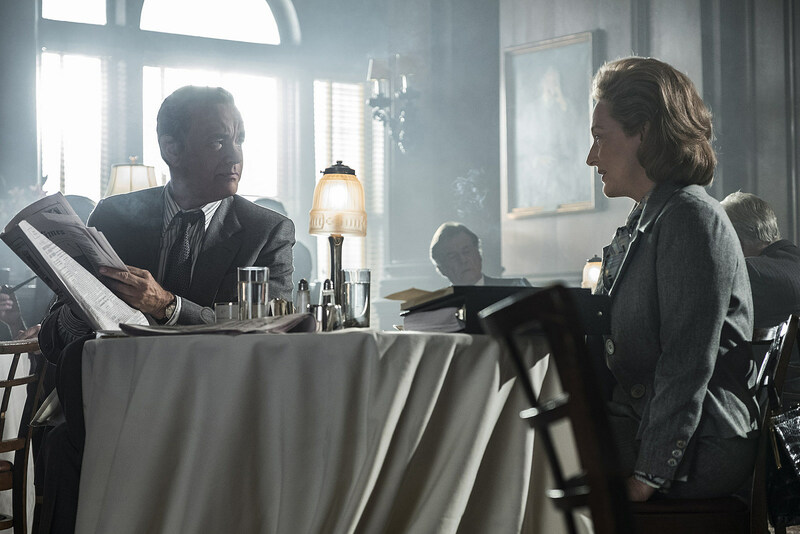 The Post is now playing in select theaters.